Holy cow! Can you believe it is out FIRST birthday?! Yep, last year, on April 20th, Suzy opened her online shop and things have been rolling from there! In that year, she has seen her first customer (Courtney Schloss), her first Design Team, and first brick and mortar shop along with a bunch of new friends! If you arrived from So Suzy Stamps blog, then you are on the right track. If this is your first stop, then head on over to So Suzy Stamps blog so that you don’t miss out on your chance to win our awesome prizes. To help celebrate So Suzy Stamps Birthday, I created this card using one of her first sentiment stamps release last year. I wanted my card to be super clean and simple. I choose to stamp two roses because we are looking forward to year number two!! I stamped my roses with My Favorite Things Hybrid Ink Pad. Then I used Copic Marker YR02, YR04, YR07 to color my roses. On the inside of my card I used Simon Says Stamp Sending and Wishing Stamp set to add the sentiment using the same ink. Super simple, elegant and pretty!! 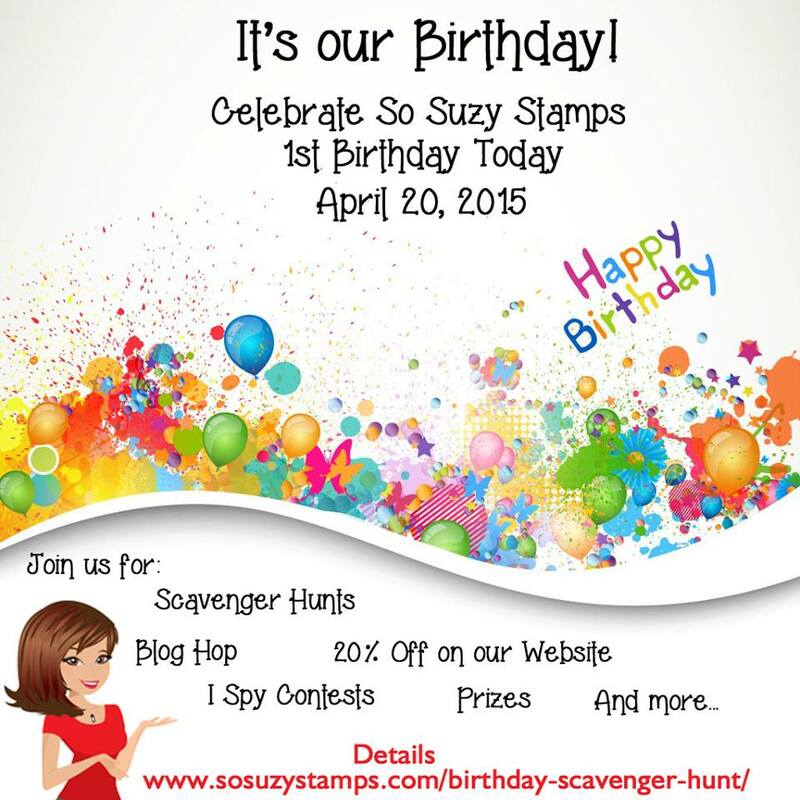 Happy Birthday So Suzy Stamps!! I wish you many more!! Now on to our super fun day! Suzy wanted to do something fun for the day and her wonderful Design Team came up with a bunch of ideas and a scavenger hunt was one of them! Before we get to the Scavenger Hunt, let’s go over some of the other fun things we have in store for you today! As far as the Scavenger Hunt goes…all you need to do is answer the questions, including the bonus question and submit it via the contact form. Please number your answers so they coincide with the question number. Out of all the entries, there will be 5 winners. The winners will need to have ALL the questions correct, they must have their answers NUMBERED and all entries will need to be submitted no later than 11:59pm MST on April 20th. All answers can be found by perusing through the website and by checking out the Blog Hop! We have already had a couple of practice runs and people were able to find them. The winners will be announced on April 22nd via our Blog. So what are you waiting for, don’t walk run and play along with us. Next up is the talented Jenny. What till you see what she has in store for you!! « Light It Up Blue For Autism Awareness Blog Hop Winners! Simple and elegant Kymona! Love it! Oh, what a great idea for 2 roses for 2 years! I really like how crisp and sweet your card is! Super cute card!! And your light box worked GREAT!!!! Woo hoo! What a sweet pair of scribbly roses, showcased in a most lovely CASilicious style! Gorgeous! Hi Kymona, I love your CAS card. It’s very elegant!!! But you’re scrap addicted, aren’t you? What hour of scraping!!!! Gorgeous roses and way to go on this very stunning and yummy CASliscious card!!!! 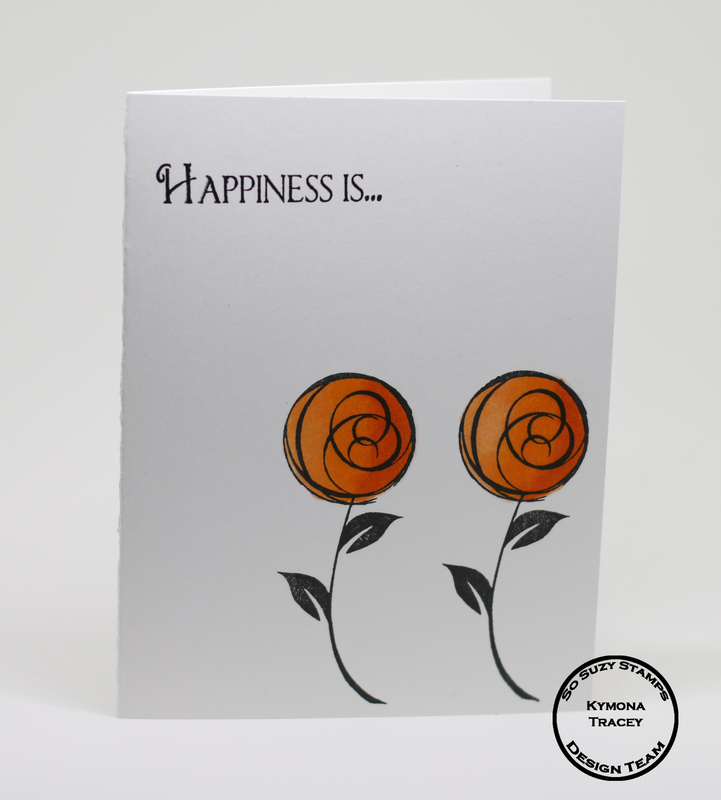 I love the simplicity of this lovely card, Kymona. So pretty. Love how you took this in total darkness! LOL Very pretty CAS! Love the simplicity. Pretty amazing you photographed it in the dark. I love how simple the card is but so pretty. I have a tendency to embellish more vs less. This is a great idea of keeping it simple. I like the simplicity of your design! Plain and simple but so pretty. It gets the job done in a wonderful way. This is CAS perfection! Love it. Perfect CAS. Love your coloring. 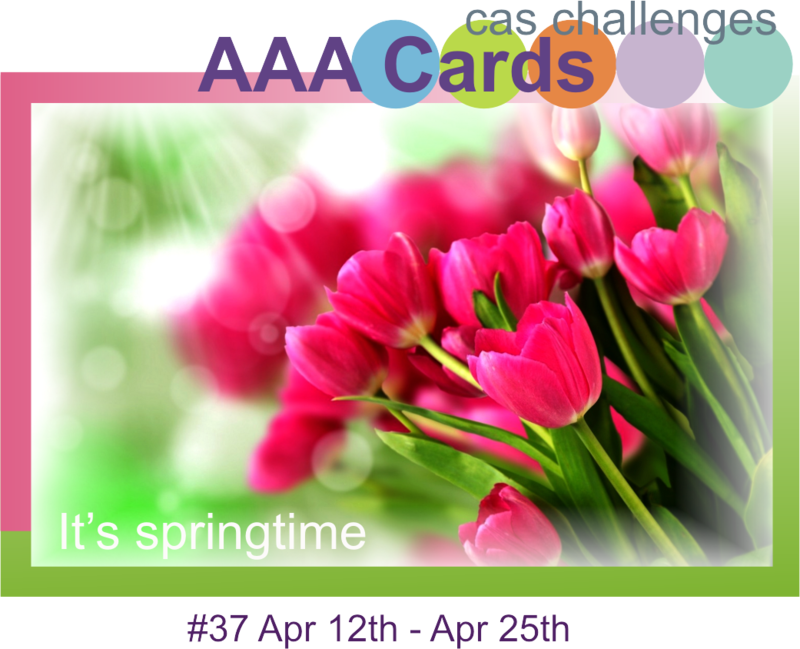 Thanks for sharing, linking up with us and playing at AAA Cards!